To identify your ideal career once and for all check out our proven, comprehensive 6-step program with a 98% satisfaction rating. This 125-page workbook is the complete coaching program we have used with all of our coaching clients for over 17 years. 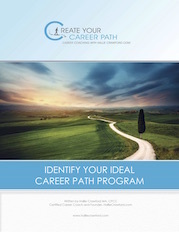 The workbook is built around our trademarked Ideal Career Model, which shows you the 8 things you must consider in order to determine your ideal career path. Complete the workbook at your own pace at a time that works for you. Our step by step coaching process, developed by certified career coach Hallie Crawford who has been coaching for over 17 years, is available at a fraction of the cost of individual coaching. This book gives you our complete, comprehensive coaching process we use with all of our clients at a fraction of the cost of individual coaching. NEED more help with your career? Schedule a FREE consult!